In days past, the term ‘root canal’ would bring about thoughts of pain and discomfort. Fortunately, times have changed, and root canals aren’t what they used to be. At Tankard Dental , we can perform this procedure gently and efficiently. A root canal removes tissue that’s been infected from the tooth roots, saving it from extraction and preventing further damage. You may require antibiotics taken before the procedure to fight off the infection. The treatment begins with administering local anaesthetic to keep you comfortable. Then, all damaged tissue is removed from the tooth root, then packed securely with a filler material. Lastly, your tooth will receive a crown that strengthens it. 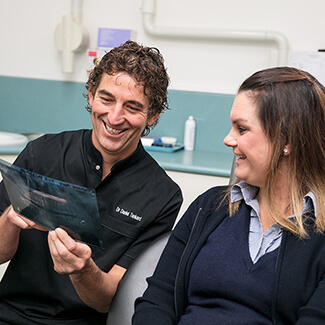 To find out more about root canal treatment in Mildura, contact us today! We accept emergency cases and will do our best to accommodate you as quickly as possible.